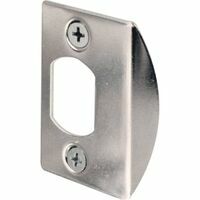 Standard T-strike, used on wood or metal jambs with most grade 2 locksets. Includes 1 strike with (2) #8 x 1" Phillips flat head combination screws. 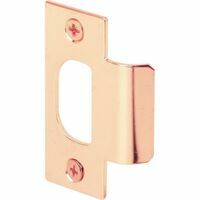 Prime Line Flip Door Lock, Prime Line, Suitable For Use With: 1-3/8 in Interior Doors, 1/16 in Thickness X 2-3/4 in Length, Steel, Brass Plated, Includes: (1) Lock and Installation Screws Rigid doorstop protects interior walls from impact damage by shielding contact point of wall and door knob. Repairs damaged walls.